The Southern Africa Center for Constructive Resolution of Disputes (SACCORD) has expressed shock that the government did not allocate any money for enacting the constitution in the 2012 budget. SACCORD information officer Obby Chibuluma has asked government to explain where the money for the burning issue will come from. Chibuluma said the PF government promised to give Zambians a good constitution within 90 days of assuming power but was surprised that the first PF budget did not reflect any such allocation. Finance minister Alexander Chikwanda last Friday proposed a K27 trillion budget to parliament which cadres are busy describing as pro-poor. But the PF government gave priority to awarding money to people who will win court cases againt the government. K200 billion has been set aside for that function. A lot of PF officials including president Sata have sued government institutions such as the public newspapers for defamation so that money is likey to go to government officials. Compared to that amount, a paltry K150 billion has been provided as Government contribution to the water and sanitation sector. Only K21.1 billion has been given for tourism marketing and promotion while just K15 billion is meant for the recapitalization of the Zambia Wildlife Authority. Chikwanda gave K120.1 billion for the Constituency Development Fund. On November 3, government outlined a roadmap to guide the Constitution-making process that will entail constituting a team of experts to carry out a comprehensive review of the recommendations by the Mvunga, Mwanakatwe and Mung’omba constitution review commissions. Justice Minister, Sebastian Zulu told Parliament that this will be followed by a national referendum. 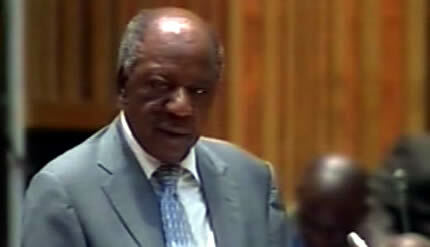 In his maiden speech to Parliament, Zulu said President Michael Sata was in the process of appointing a technical committee to consider the recommendations from all the three constitution review commissions as well as the failed 2010 Constitution Amendment Bill in order to come up with a comprehensive draft document. Zulu said enacting a proper Constitution was a serious undertaking that would require more than 90 days. He said the draft Constitution would be circulated to all Zambians for examination after which a referendum would be held and thereafter, the matter taken to Parliament for enactment. “The process will, therefore, take longer than 90 days more so that we want to come up with a good Constitution that will stand the test of time,” Mr Zulu said. And on Saturday, information minister Given Lubinda was quoted saying that the team of experts would be appointed by the end of the year. Lubinda also tried to edit the meaning of the 90 days theory by saying that his party meant that within 90 days, it will initiate development projects.